TRIBES, produced the Ensemble Theatre of Cincinnati, is a regionally premiering play by Nina Raines that presents sociological themes, issues in deaf culture, and mostly the idea of belonging. Belonging to a group, a family perhaps, or perhaps a group of like minded, or like-abled people. Billy, played marvelously by hearing impaired actor Dale Dymkoski, has always had to conform to the hearing world because his father didn’t want him saddled with a disability. And while Billy has overcome many obstacles of being deaf – he’s a brilliant lip reader, for instance – what his father didn’t realize was that the Billy felt very left out. And not just out of conversations. But when Billy meets Sylvia, the daughter of two deaf parents, his world is rocked. Not only does Sylvia understand what deafness is like from the outside, she herself is losing her hearing. Kelly Mengelkoch in her debut role at the Ensemble (usually you can catch her a few blocks away at the Cincinnati Shakespeare Company) is an on stage dynamo of emotion using her words, sign language, and even a piano solo to express the pain and sense of loss that one must feel when they lose one of their senses. I was mesmerized by her performance. The rest of the cast is also solid. 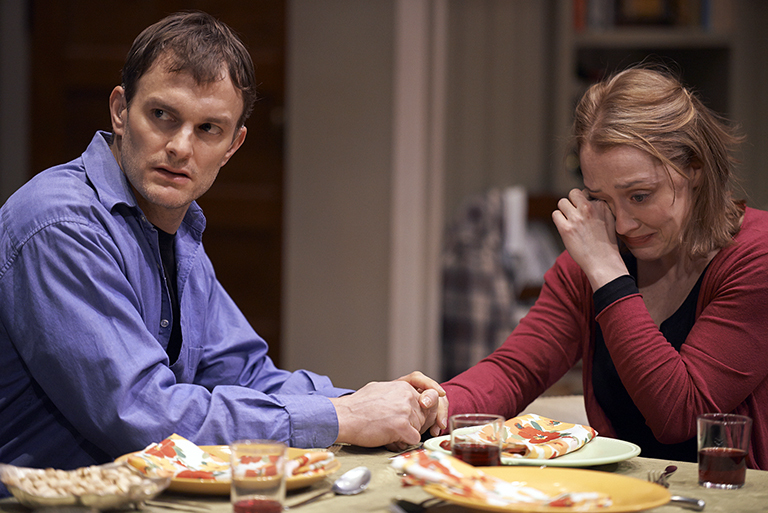 Jennifer Joplin (“Ruth”) plays ordinary in an extraordinary way. Ryan Wesley Gilreath who was very likable as Bob Cratchit this year at the Playhouse gets to sink his teeth into another complex character, much like the one he played in OTHER DESERT CITIES at the Ensemble, but this time he shows a tender side, too. Barry Mulholland is grumpy, strong in his convictions, and buoyant in his aggression towards anyone who thinks differently than he. And Amy Warner, who is quickly becoming one of my favorite actresses to watch on stage, shows a lot of restraint as the mother who wants to do the right thing but is too overcome by her empathic gift/curse to have all the answers. As always, the set by Brian C. Mehring is ridiculously well done and Shannon Rae Lutz’s props flesh it out to make it feel like a real lived in home. I can’t imagine the amount of time she invests in selecting the small touches – like the books stacked on the floor – that seem like they would actually belong to the characters living on the stage. I didn’t love everything about the script and I wish the actors could have said their lines without the British accents, but perhaps this was a choice made to show even more dissonance between Billy and his family. Perhaps my favorite thing about the play is when Sylvia comes to meet the family for the first time. . . and the table is set with 6 plates – 5 yellow and 1 green. Was this purposeful by the family to make her feel like an outsider? Or was this because Billy has been an outsider his whole life in a family that refused to allow him to embrace his deafness and just a subtle undertone by the best prop mistress in town? Either way, I love those kinds of touches. The play does not pretend to have any answers, but it certainly brings up a lot of thoughtful questions. I hope that the deaf community – and all in the audience, really – is as moved by it as I.
TRIBES plays at the Ensemble Theatre on Vine Street in Over-the-Rhine through February 16th. Tickets are available here.